Gets better as it goes on, but is never really anything all that good. 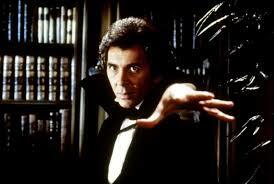 The Frank Langella Dracula movie isn’t really anythin special at all. for one thing, the first half of the movie is incredibly slow and boring. There is one real attack in that half, and nothing more. In the second half of the film, Van Helsing shows up (played by Laurence Olivier), and starts putting the pieces together. He’s the one who targets dracula and goes after him. this is where the movie starts to get exciting. there are a hand full of cool scenes in the second half, but even then, it feels like something we have seen before. The movie never really amounts to anything great. Dracula is a pretty lousy rendering of the story. For one thing, this story has been done so many times, that to stand out, a retelling of it would really have to get creative. There’s the original Bella Lugosi film, along with Coppola’s Bram Stoker’s Dracula, Christopher lee’s film, this frank langella version, and countless others. And while there are definitely some cool things about this movie, they can all be found in the second half, and even then things don’t get all that great. The movie is about a small town right along the water, where there is a mental institution and a new land baron coming to live. That land baron is count Dracula. He arrives on a ship; only he is steered away in a coffin while the ship is at sea. There is an attack on the ship, and everyone on board is slaughtered. We don’t see exactly what happened to them, but when it’s all said and done, the ship has crashed into the land, and everyone on board has had their necks slit or has in some way been brutally killed. A young woman named Mina is walking along one night, after the destruction of the ship, and comes across the body of Dracula, unconscious and possibly dead. She gets help, and soon Dracula is alive and well, getting back on his feet. He goes to his home, up on top of a mountain, and not long after that, is invited over for dinner by some of the upper class people in the town. These people include a nice couple, Jonathan and Lucy. One night, Dracula climbs up the side of mina’ wall and breaks into her bedroom. He bites her and kills her, and she doesn’t object or struggle at all. It’s as if she is in a trance, having been hypnotized by him. The next day, doctors come and look at her, but nobody can tell exactly how she died or really notices the bite marks on her neck. If they do, then they certainly don’t make a big deal of them. This is pretty much all that happens in the first half of the film. It’s all setup, but other than the attack on mina, it’s not very exciting. There’s another moment where a man is delivering packages to Dracula home, up on the mountain and suddenly Dracula appears at the top of the stairs. He instantly turns into a bat, and the bat flies down at the man and bites him. This man winds up in a mental institution-eating bugs. In the second half of the movie, Van Helsing shows up. The great actor, Laurence Olivier, plays him and mina was his daughter. Van Helsing has come to discover why and how his daughter was murdered. He at once gets to work on figuring out what the bite marks are all about, and starts looking at a book on vampires. Things have started to get more interesting already. It’s nice when characters aren’t playing dumb, like everyone was in the first half, and instead are taking action. Things really start getting good when van helsing decides the only way to know for sure, what he is up against, is to dig up his daughter’s grave. He goes out to do this one night and finds that the coffin is empty. Van helsing climbs into it and finds that there is a hole in the side of it, leading further underground, into a tunnel. He goes through the hole, down the tunnel, and finds himself in an underground cave. Once in the cave, van helsing finds his daughter. She is alive, but has now become a vampire, and she attacks him. This is one of the great moments of the movie. There are really only two or three, and this is definitely one of them. The setting of the scene, down underground in a cave, is what really gives it that extra edge. 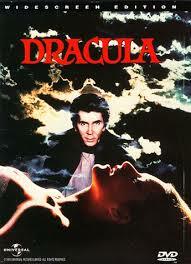 From here, the movie becomes about van helsing vs. Dracula. Van Helsing knows who Dracula really is, and it isn’t long before Dracula finds out what van helsing knows. He attacks Lucy in the same manor that he attacked mina earlier in the movie, and now Jonathan’s struggle, for the rest of the film, is to get Lucy back to being free of the vampire curse. He starts by giving lots of blood to her, in order to bring her back to life. There aren’t a whole lot of exciting scenes in this movie, which is a big part of the problem. Certainly whatever excitement there is, all comes in the second half. At that point, we can be happy that now things are actually happening, but most of them are things that we have seen before in other films. The climax on a ship is fantastic, and is actually the coolest part of the movie. While climaxes generally are meant to be the most exciting parts of any story, this one is on such a level that nothing else in the movie even came close. That’s a shame, because if more of the movie had been handled like this, it would have been a much better film.